Get low-cost ways here to adorable wooden furniture! Sometime it may also be free to all homey people if it is easy for them to reach pallets! 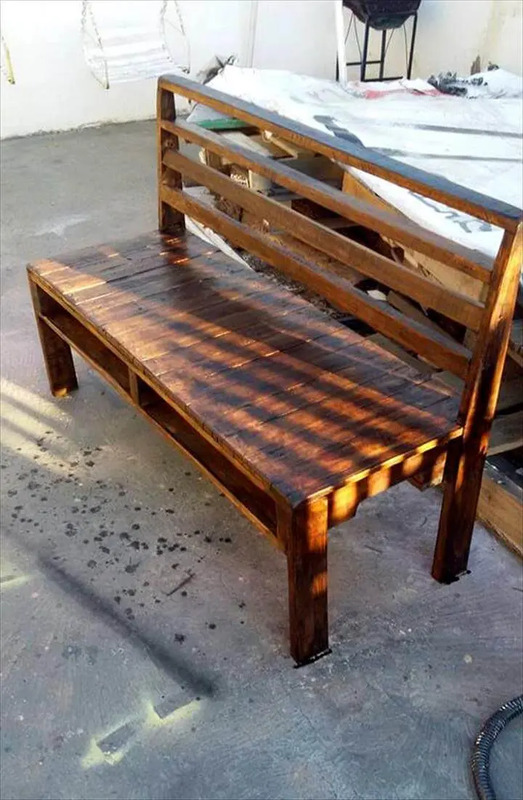 This time we are going to surprise you with this DIY rustic pallet bench, got for outdoor sitting affairs and purposes and robust structure pattern ensure its longer functional life at outdoor! 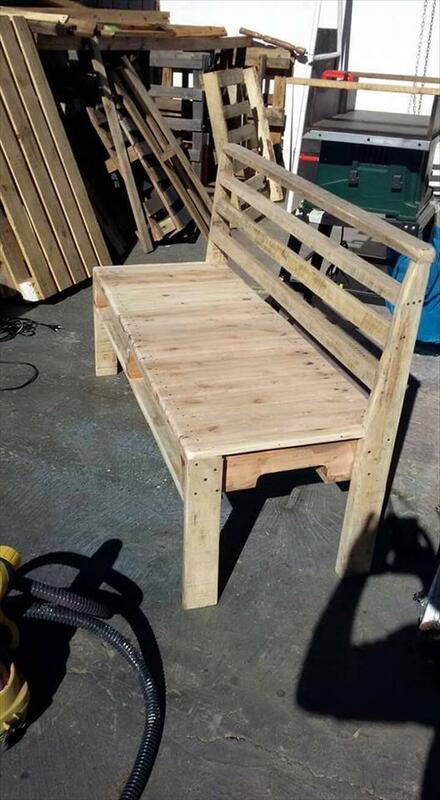 Main task before getting yourself in the construction, would be the deconstruction of pallet skids, get the single skids to install this fancy looking model of wooden bench! 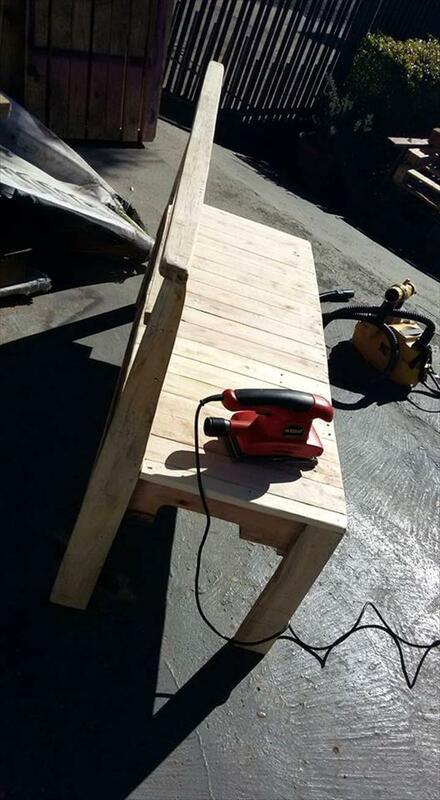 Here a whole long pallet board, refilled to be solid, gives the entire berth position of the bench and thicker wooden planks with sharp cuts to their top side, have been put vertically in the bench frame to install the backrest position! These thicker slats also give the rear legs of the bench! Then 2 more pallet slats have been resized to use as front legs and finally the cross alignments of longer pallet slats have been done to fill up the backrest! Sand well the bench surfaces before paint or stain and you can go with any custom finish that will give you the desired final look of it! Pallet pieces have been cut down in accordance with precise measurements already taken! Angle ruler and measuring tape may the best tools here for accurate measurements which will result into better bench model! Palm the power sanders and sand down the surfaces and make sure you have got the surfaces smoother to touch and splinter free as well! Assemble the parts together with nails and just install basic model of wooden bench which can be finished then after for a a custom look! 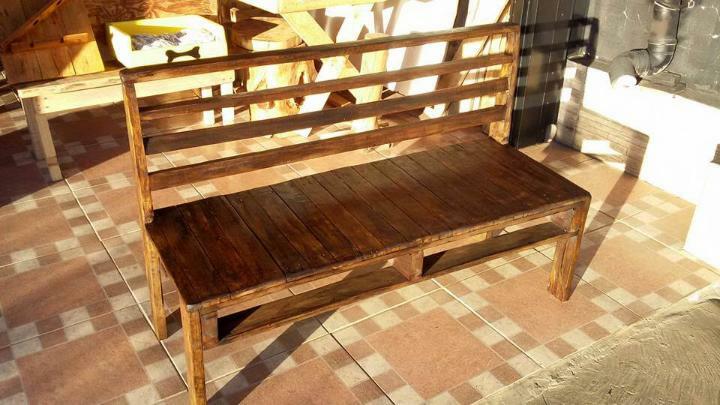 Here this handcrafted outdoor or patio bench has been made appear in darker tone of wood and to do respective shades of stain has been used! Stain coats leaves the alluring shine on the wood grains and make the wooden surfaces water and weather protected! 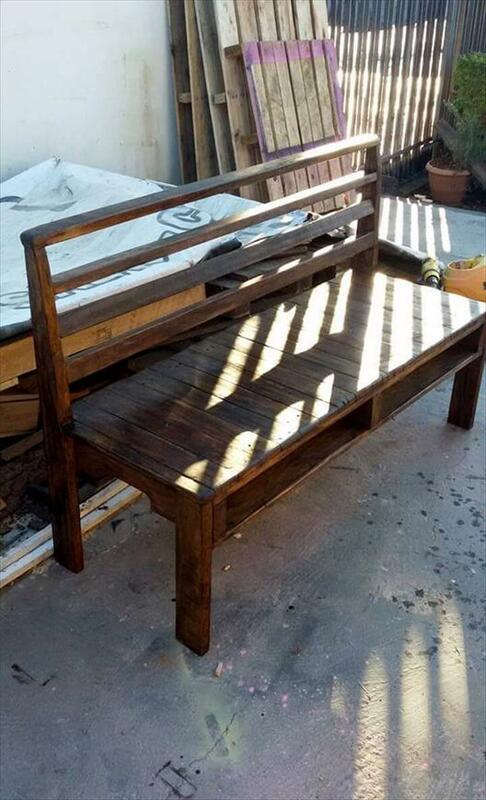 Paint would also be a great choice for a custom colorful avatar of this wooden bench! 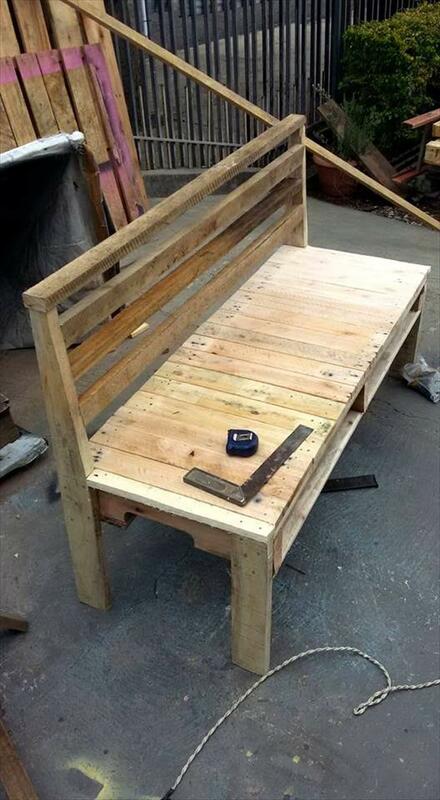 Finally finished pallet bench is ready now to decide for a desired outdoor location where you just love to sit in your spare or free time! This bench would be awesome for 3 people who can sit together to enjoy the outdoor site of home and also the gossips!